Nurses are at the heart of joined up care: they often see the parts of the patient pathway that other healthcare professionals aren't involved in and have a holistic view of the patient's needs. On a bigger scale, their insights can build up into a picture of what is needed to improve care locally. So nurses should be in an ideal position to contribute to the development of more integrated care, whether that contribution is a director of nursing leading on a workstream or a community nurse involved in the redesign of a particular care pathway. There have been various attempts over the years to improve the coordination between health and social care services and move towards integration. The most recent development are integrated care systems (ICSs). NHS England announced ten areas that would develop the first ICSs in June 2017. Essentially, NHS organisations work with local partners such as councils to improve health and social care, promote population health and well-being, and make better use of resources. There is widespread acceptance that the collaborative approach of ICSs is necessary to meet the challenge of our ageing population, with growing numbers of people living with long-term conditions. A new report from the King’s Fund, examining eight of the first ICSs, has found encouraging signs that they are beginning to make a positive difference to health and care, with organisations coming together to work as systems. You could be forgiven for being confused by the name – until recently ICSs were known as accountable care organisations or ACOs. The plan to set these up was controversial – and prompted several judicial reviews – and eventually the name ICS was adopted. ICSs have grown out of sustainability and transformation partnerships (STPs), which grouped together NHS organisations and local authorities to implement the ideas in NHS England’s Five Year Forward View. 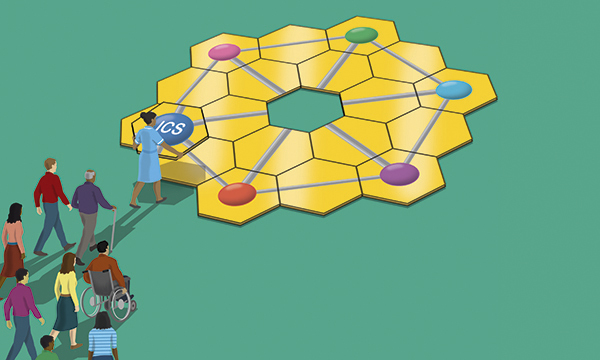 Some of the best-functioning STPs were chosen to develop ICSs – although ICSs do not necessarily cover the whole of an STP area. ICS are groupings of NHS organisations and local partners such as councils. The care they provide to patients is meant to be more integrated, with staff from different employers working closely together. But ICSs look beyond the experience of current individual patients and plan to make care better for everyone. They are meant to take on responsibility for managing resources, achieving NHS standards (such as the referral to treatment time or A&E four hour waits) and improving the health of the populations they serve. In the longer term, they offer a mechanism to shift the system towards prevention and early intervention, and to positively influence the wider determinants of health. There are currently ten ICSs where powers have been devolved to the local health system by NHS England – and others are at an earlier stage of development. NHS organisations in ICSs have a shared ‘control total’ – the amount of money NHS England and NHS Improvement expect them to have as a surplus or deficit at the end of the year. In theory, this gives them an incentive to work together. However, the report highlights some of the challenges ICSs face in relation to leadership. It noted there is a need to engage clinicians in leadership and to free them up from other commitments to work on developing more integrated care. Among the report’s recommendations is that front-line staff be released from some of their commitments to enable them to lead care innovations. RCN north west regional director Estephanie Dunn says nurse engagement and leadership is critical if integrated care systems are to improve health for their local populations. She agrees with the King’s Fund that one of the challenges will be giving nurses time to lead when their day-to-day life is so pressurised. Workforce shortages are making this even harder. Nurses are often the people who see the impact of the wider determinants of health such as housing, she adds. If the workforce issues are to be understood, and solutions developed – such as using staff in different ways – then nurses need to be at the top table, where decisions are made. She points out that the nursing voice can also be absent lower down in the system, at the point when strategy is being implemented in practice. Even in Greater Manchester, which has been moving towards integration for some years, nurse engagement is not perfect. Ms Dunn says there has been progress, such as directors of nursing working with higher education institutions on identifying and addressing particular areas of workforce pressures, but senior nurses still don’t have as much clout as doctors. ‘When you look at where those senior nurses are, it is not at the top table,’ she says. There is some evidence of nurse involvement in ICSs. For example, in Berkshire West directors of nursing sit on the clinical delivery group – although they are not involved in the leadership group. Some ICSs have taken steps to strengthen clinician engagement – in Frimley, in Surrey, for example, a leadership programme has tried to move away from traditional hierarchies and to promote collaboration. But experience suggests that when new structures are set up, nurse leadership tends to be overlooked. Nurse engagement with sustainability and transformation partnerships (STPs) was initially low in some areas. And the RCN had to campaign to ensure nurses got a seat on clinical commissioning boards. One area that does seem to have got to grips with nurse engagement at all levels is Lancashire and South Cumbria ICS, which includes five clinical commissioning groups, four acute trusts, one community and mental health trust, an ambulance trust and four local authorities. The ICS has been able to draw on a tradition of joint working between organisations. Now it is looking for nurse engagement at the strategic level in its five localities and right down to neighbourhoods. Jackie Hanson is director of nursing and care professionals for the ICS and NHS England. She says having a director of nursing was a strategic move by the ICS, which wanted a strong nursing input. ‘We have a care professionals board that involves nursing leadership from different organisations as well as therapists, pharmacists and doctors who come together to give that real clinical view,’ she said. This is also important when thinking about future workforce needs and issues such as adopting new technology, she adds. Importantly, the ICS region, which has a population of 1.7 million people, is divided into five smaller areas where work is going on to develop nursing and professional leadership. ‘We are trying to embed the clinical voice at all levels in the system,’ says Ms Hanson. Ms Hanson adds that there are always challenges in releasing people from the day job and giving them the headspace they need to think about improvements, but nurses are keen to contribute. Developing staff understanding of the ICS and recognising that no one organisation could solve all the problems was also important. Ultimately, seeing the ICS have an effect on the health and care system drove engagement. ‘The jobs our staff are doing are hard but everyone wants to come to work to do the best job possible. Clinicians, along with patients, have the answer to many of the problems,’ she says.